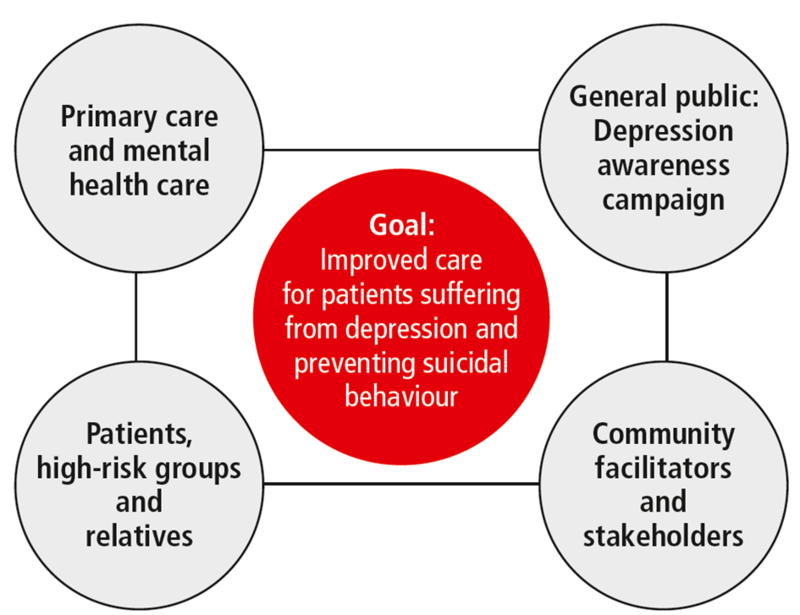 To improve the care of patients with depression and to prevent suicidal behaviour. Depressive disorders are characterized by a recurrent, often chronic, course. Up to 15% of patients suffering from severe and recurrent major depressive disorder commit suicide. Although effective treatments such as antidepressants and psychotherapy are available, it is estimated that approximately 50% of patients with major depression receive no treatment at all and only 10% receive optimal care. This treatment gap highlights the need to create a public environment that reduces stigma and encourages people with mental health problems to seek help. The aim of the European Alliance Against Depression (EAAD) is to promote the care of people living with depression and to prevent suicidal behaviour by initiating community-based intervention programmes. The EAAD also conducts and supports research on depression and suicide prevention across Europe. The depression treatment gap results from problems with both supply of and demand for services. Mental health services almost always fall short of the depression treatment guidelines, both in terms of quantity and quality. Disease-related factors associated with depression – such as hopelessness, lack of energy, shame and feelings of guilt – result in poor help-seeking behaviour and low rates of adherence to treatment. The stigma associated with depression and the lack of knowledge about depression among health professionals and community facilitators further contribute to under-diagnosis and under-treatment. These factors highlight the need to address the treatment gap using multifaceted interventions. EAAD was founded to establish a network of experts across Europe, with the objective of implementing action-oriented, community-based public health interventions to improve depression treatment and to reduce suicidality. It is based on the concepts and materials that were developed in the context of the Nuremberg Alliance Against Depression. Interventions targeting depression and suicidal behaviour were initially implemented across 17 European countries in two project phases, using comparable intervention materials and following the 4-level intervention concept developed by the Nuremberg Alliance. The concepts and materials of the Nuremberg Alliance Against Depression were improved and complemented by input from EAAD partners, translated into different languages, and adapted to national and local needs. An awareness website providing detailed information on depression, tailored to the general population as well as young people, family and friends, community professionals, and healthcare professionals. The website also includes a self-test checking for symptoms of depression. A guided, internet-based self-management tool for individuals experiencing milder forms of depression that is free of charge for the patient and uses principles of cognitive-behavioural therapy as a basis. It is currently available in Basque, Catalan, English, German, Greek Spanish, Estonian, Norwegian, and Hungarian. The tool consists of informative modules that focus on increasing daily activity, identifying and challenging unhelpful thought patterns, monitoring mood, adopting healthy sleeping patterns, and maintaining a healthy lifestyle. Worksheets and exercises keep the user actively involved and promote self-monitoring. Training materials (e.g. an online training) for healthcare professionals who are interested in implementing iFightDepression® in their practice. 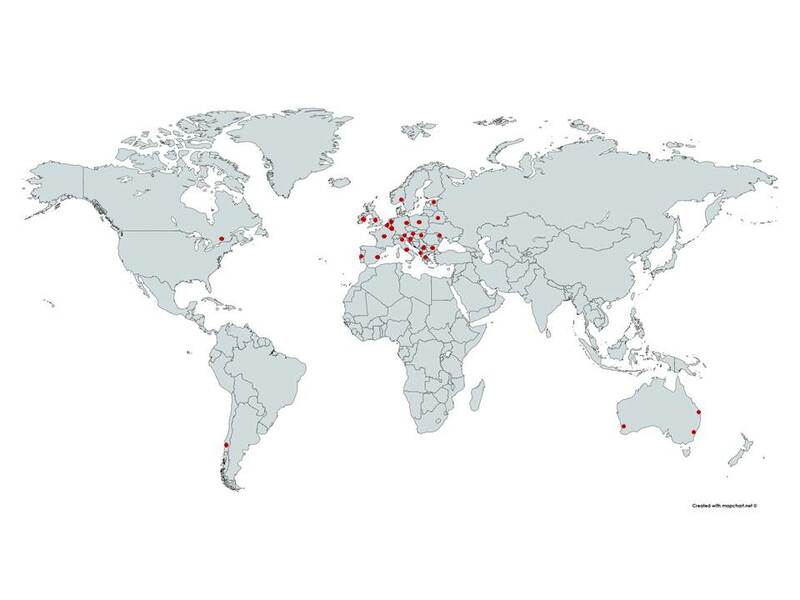 National chapters are currently operating in Australia, Austria, Belgium, Canada, Chile, Estonia, Germany, Hungary, Ireland, Italy, Luxembourg, the Netherlands, Norway, Portugal and Spain, with further associate members in Albania, Belarus, Bulgaria, France, Greece, Italy, Kosovo, Moldova, the Netherlands, Poland, Slovenia and the United Kingdom. The 4-level intervention concept of EAAD can be adapted to and implemented in different European cultures and health care systems. The EAAD approach enables greater focus on depression than on suicidality when conducting public information activities, avoiding the risk of inducing suicidal acts. A stronger focus on suicide prevention is given when teaching and cooperating with health professionals. Interventions appear to have broad destigmatizing effects. The main challenge is a lack of national funding in some countries that do not foresee suicide prevention in their health action plans. Since part of our approach targets GPs and primary Mental Health Care, many regions struggle with conducting training sessions for these professionals that are very short on time and do not get reimbursed for using eMental Health tools in their practice. The aim of the EAAD is to implement the 4-level intervention programme across Europe. OSPI-Europe2-4 (Optimizing suicide prevention programmes and their implementation in Europe) was a collaborative research project, with the aim to optimize the existing approach and provide EU Member States with an evidence-based intervention concept, concrete materials and instruments for running and evaluating these interventions and recommendations for the implementation and scale-up of the intervention. Partners within EAAD have evaluated their activities concerning changes in suicidal behaviour, changes in public attitudes and changes in knowledge about depression and suicide among general practitioners and community facilitators. The effects of the 2-year intervention on the number of suicidal acts (completed suicides and suicide attempts) were evaluated with respect to a 1-year baseline and a control region (Würzburg, 270,000 inhabitants). Costs of a local campaign depend largely upon the size of the intervention region and the specific modules implemented, which may include an awareness campaign, PR activities, training, etc. 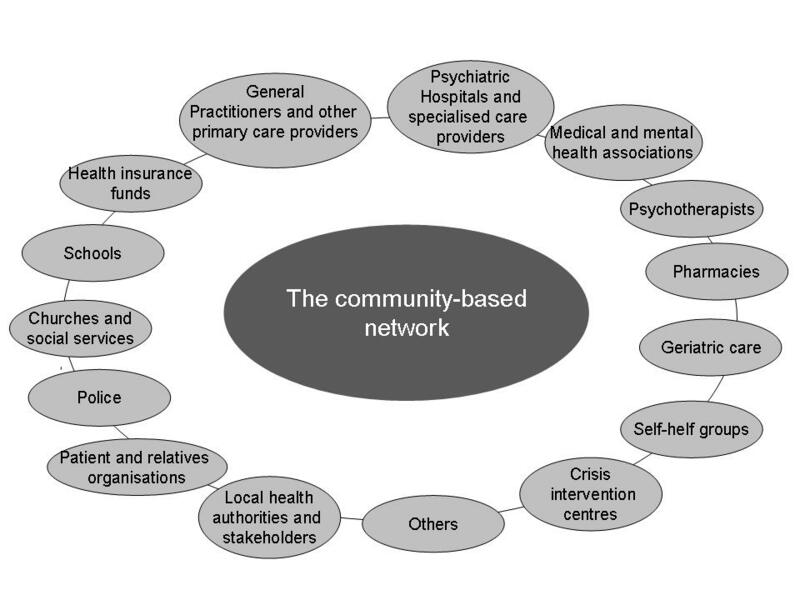 Although local costs vary, there is reasonable evidence that community-based 4-level intervention programmes targeting depression and suicidal behaviour are a cost-effective approach to suicide prevention. The iFightDepression® website and the self-management tool as described above are free of cost for patients (=end users). A statistically significant and clinically highly relevant reduction in suicidal acts was found in Nuremberg compared to the control region Würzburg. Suicidal acts in Nuremberg fell from 620 in 2000 (before the project was started) to 471 at the end of the 2-year intervention, corresponding to a reduction of 24%. This finding mainly reflects a reduction in suicide attempts. Evaluation of a 4-level intervention in the Hungarian town of Szolnok resulted in a sharp decline in suicide rates from 30 per 100,000 in 2004 (before the project was started) to 12 per 100,000 in 2007. This 60% decrease was significantly greater than that observed across Hungary and in the control region. This training was conducted to improve knowledge, attitudes and confidence in relation to depression and suicidal behavior. In fact, gatekeeper trainings in community settings show significant improvement of knowledge, reshape of attitudes, and confidence boost. Vasiliadis HM et al. (2015) Implementing Suicide Prevention Programs: Costs and Potential Life Years Saved in Canada. The journal of mental health policy and economics 18.3 (2015): 147-155. Coppens E et al. (2013) Public attitudes towards depression and help-seeking in four European countries: Baseline survey prior to the OSPI-Europe intervention. Journal of Affective Disorders. Journal of affective disorders, 150(2), 320-329. Coppens E et al. (2014) Effectiveness of community facilitator training inimproving knowledge, attitudes, and confidence in relation to depression and suicidal behavior: Results of the OSPI-Europe intervention in four European countries. Journal of affective disorders, 165, 142-150. Maloney J et al. (2014) Media recommendations on reporting suicidal behaviour and suggestions for optimisation. Acta Psychiatrica Scandinavia. Acta Psychiatrica Scandinavica, 128(4), 314-315.